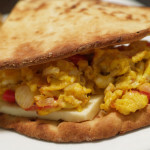 So, a quesadilla is made of dough or flour or wheat and usually contains cheese and other ingredients and literally means “little cheesy thing.” Doesn’t that sound exactly like a grilled cheese sandwich? I think so. Therefore, today, I christen a quesadilla a Mexican grilled cheese. If you disagree, please take it up with the boss. Now onto the veggie quesadilla. 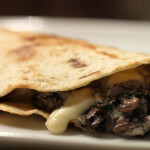 Previously, I tried Cocina Selecta’s Queso Quesadilla cheese and I really enjoyed it. The Queso was a great Mexican cheese that I loved so when I decided to make an actual Mexican grilled cheese, I tried another Cocina Selecta cheese: Asadero. Prior to cooking, I take a minute, try the cheese, and form an opinion. Tonight, upon tasting the Asadero cheese, I almost decided to skip the meal and continue to munch on this heavenly cheese. That is how good this cheese was. This famous cow’s milk cheese from the Oaxaca region is a stretched curd variety similar in texture to Provolone. White or pale yellow, the semi-soft cheese is kneaded and wound into balls before being plunged into brine for several minutes. It has a mild to sweet and buttery flavor…learn more about Mexico and The Caribbean cheeses. This cheese was mild. It was sweet. And it was buttery. Oh and did I mention that it was awesome? I do not really have anything to add to I Love Cheese’s description other than to say, if you are able to try this cheese, you should. Trust me, you won’t be disappointed. Now that I have told you to go buy some Asadero cheese, let’s move on to the other cheese of the evening: Colby-Jack. Although I believe we have used it before, my search says we have not. Like the Asadero, this cheese is soft and buttery, but it has a nice, subtle kick to it. Although it is not the preferred cheese of the evening, it should not be discounted. Take two things you love a lot and blend them together. That’s the story of Colby Jack. A combination of Colby and Monterey Jack, Colby Jack’s flavor ranges from mild and mellow, to lightly sweet, to sharp and tangy. Tonight’s veggie quesadilla mixture included the following ingredients, which were inspired by this recipe at AllRecipes.com. I tried to use ingredients within the veggie quesadilla that are a-typical and I believe that I have succeeded. I mixed all of the above ingredients together and then sauteed them in a pan until they were beginning to soften. 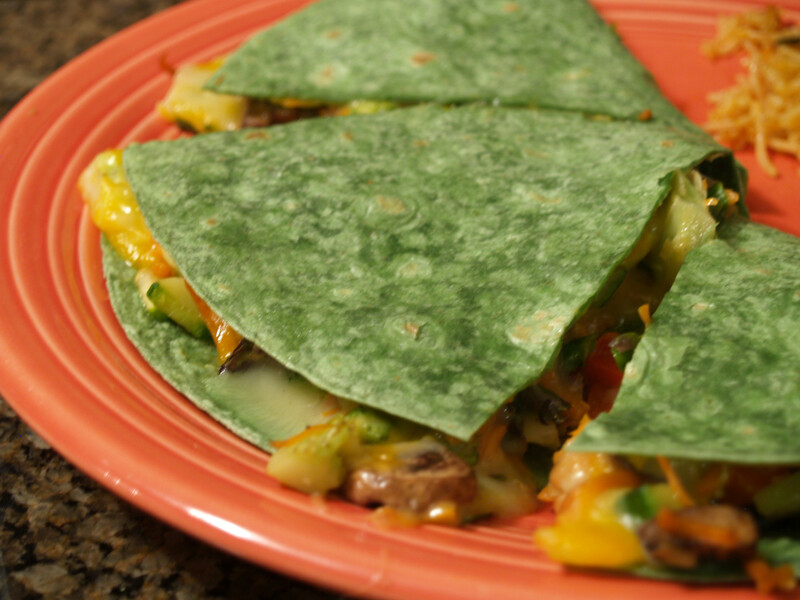 Once that happened, I scooped the mixture onto half of the tortilla shell, placed the Asadero and Colby-Jack cheese on top and then folded over the shell. I then popped that into the oven and baked it until the cheese was completely melted. Pretty simple, if you ask me! One of my go-to complaints when creating these sandwiches is that there is not enough of a kick. 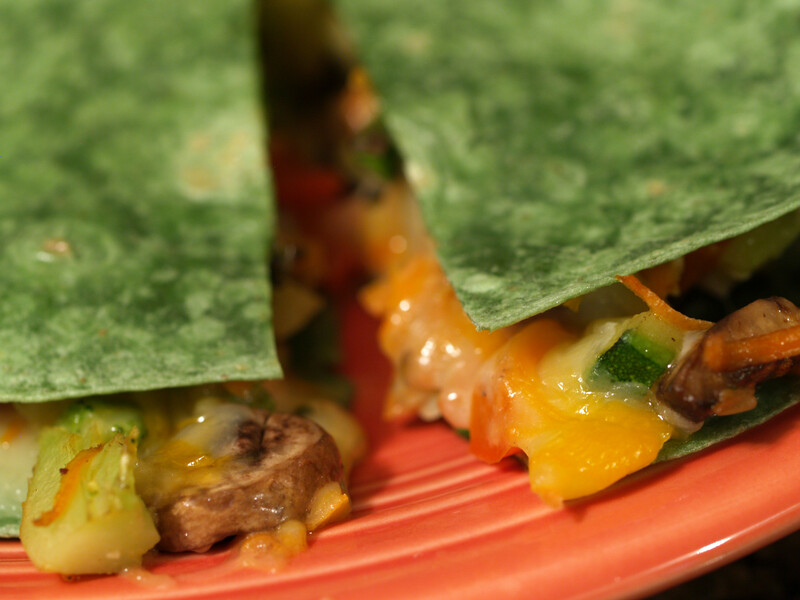 Well, let me tell you, tonight’s veggie quesadilla was definitely not missing the kick. It was there and present. 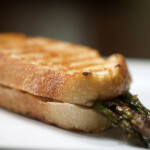 I am glad that I finally created a grilled cheese with a kick, although, it probably would have been better toned down a bit. I believe that all of the ingredients included in the mixture, of which there were a lot, worked perfectly together. I was not able to taste any of the ingredients individually, but together, they tasted great. There was some crunch and some smooth, all leading to a great texture combination. Oh and with the melted awesome cheeses, this was something good. At times, the cheese did overpower the other ingredients. 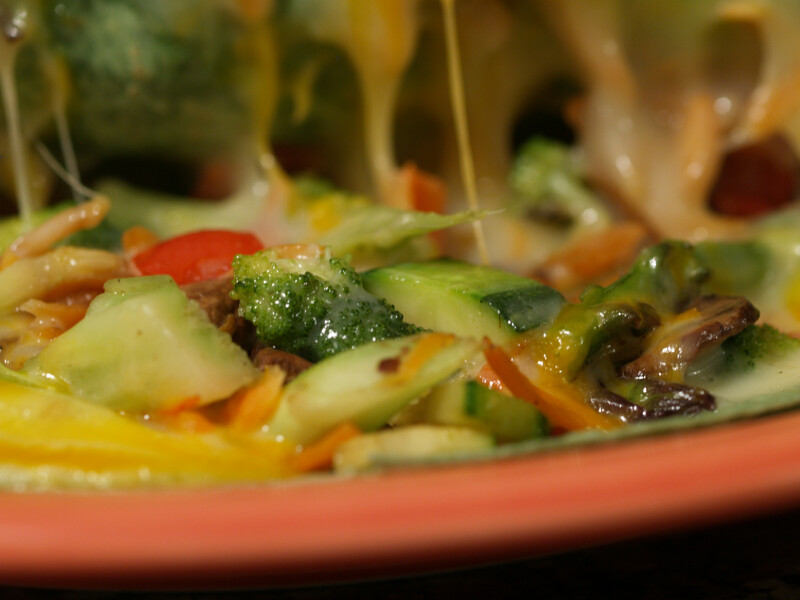 To combat this in the future, I may use less cheese, so just so the vegetables could shine as well. No matter if you agree with my assertion that a quesadilla is just a Mexican grilled cheese sandwich, you should try this. It was good and something I would make again, regardless if I was looking for a grilled cheese or not. 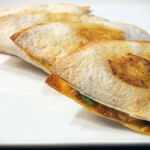 The typical veggie quesadilla is usually just a few different types of cheeses, so this is definitely a step-up. I have a third left to eat, which I plan on doing tomorrow evening. If any other thoughts pop into my head, I will make sure to add them. Posted in Grilled Cheese and tagged A, asadero cheese, asparagus, baked, broccoli, carrots, colby-jack, onions, portobello mushrooms, quesadilla, red chili pepper, red peppers, shallots, spinach tortilla, zucchini. I would say that you are spot-on in your assessment of a quesadilla as a mexican grilled cheese sambo – I would find it hard to argue otherwise! And greg, at this point, I am not even sure how I rate/grade these sandwiches. Although, I did have leftovers this evening and it really was good. The “kick” intensified, but I was a big boy and took it like a man! You could potentially make a table with qualifications on how you grade them, but I personally think your arbitrary assignation of a grade based on your overall experience is plenty scientific when it comes to food. A quesadilla is totally a grilled cheese sandwich. And is my go-to choice, because apparently I am unable to make a real grilled cheese sandwich without upsetting the smoke alarm. @ Dan: That is a good idea but sounds like way too much work. Ha. 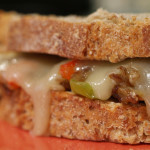 What would be interesting is remaking some of these sandwiches and seeing if I would give them the same grade! @ Angry Brit: Glad you agree as well! Keep trying to make a grilled cheese sandwich. Practice makes perfect. Maybe one of these days the smoke alarm will be kind to you!